The Sinch brand is about making innovative products to protect and organize personal electronic devices through good design and smart engineering. 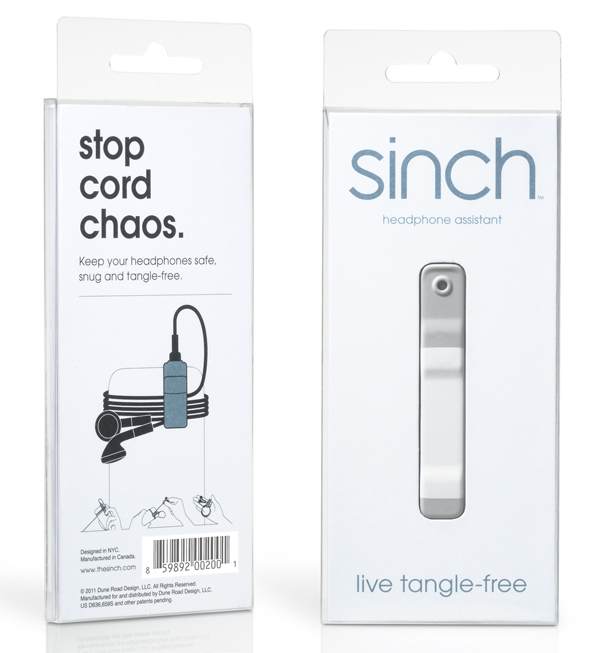 Dune Road Design and frog have collaborated in launching the first product, the Sinch; a refreshingly simple and original solution for ending the frustration of cord chaos so that smart device users may live tangle-free. Dune Road Design and frog have worked closely in all aspects of design, engineering, industrialization,brand development, naming, identity, and website development in bringing the Sinch from idea to market reality. More people are using smart devices than ever before, which means more people are spending their precious time dealing with a common problem: snarled headphones that are difficult to manage and hard to access in pockets and purses. The lack of a compelling solution brought Dune Road Design to frog. Our collective goal was to create a product for living tangle free. A product that is playful, intuitive, and simple in the way it is scaled for the task at hand. The secret of the Sinch lies in its design. Rare earth magnets are housed in an elastic band, which attaches to the audio plug on any smart device headset. 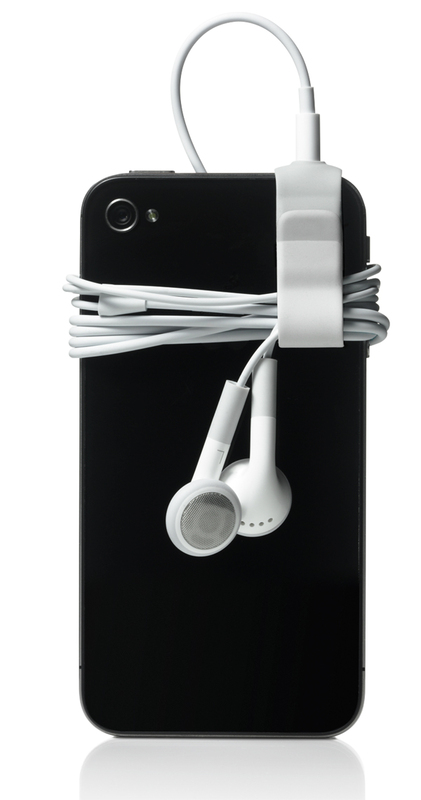 Based on a common user behavior — wrapping or coiling attached cords around smart devices — the Sinch is a universal solution designed to secure most headphones quickly and easily. Sinch allows the user to keep the headset at the ready, deployed with just a tug to the ear buds, while also keeping the cord wound securely for pocketing on or off the device. Our project began with the design team launching into a rapid ideation phase. We generated a couple dozen possible solutions to the problem, ranging from highly mechanical devices to jewelry-like cord accessories. Because of the tactile nature and small scale of the elements we were dealing with, nearly all our early ideas were immediately realized as hand-made 3D mock-ups, rather than being sketched out on paper or modeled in CAD. The mock-ups gave the immediate experiential feedback critical for determining whether or not a given design lived up to the sought-after experience. Dune Road Design came into the project with the initial idea of utilizing magnets for their playful, magical quality. As the frog designers looked to integrate magnets into the first couple of design iterations, we realized that a hard mechanical device would be too imposing on the user. Part of the experience we were after was a physically discreet presence, not adding bulk to the user’s devices. 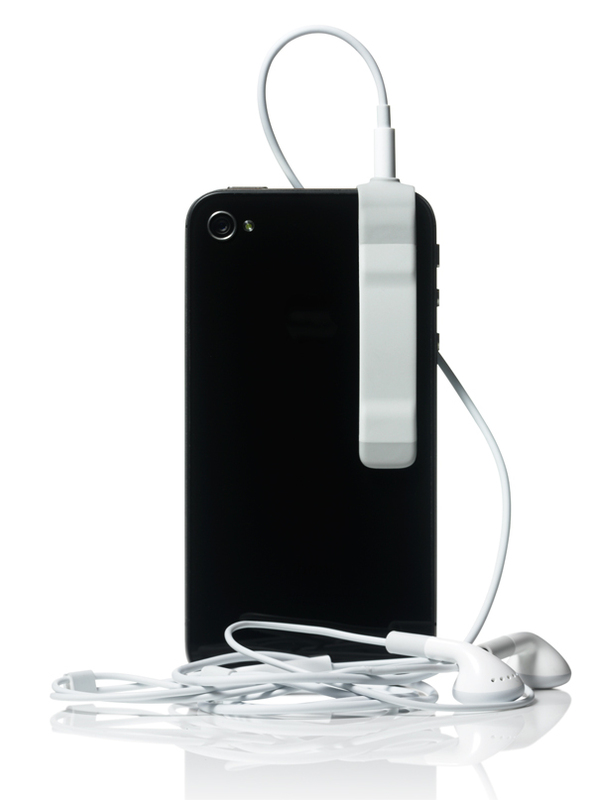 The idea of using a flexible strap with magnetic closure quickly rose to the top. We kept wrapping the cord around the devices, looking for a natural motion to secure the ear buds at the end of the cord to the device. 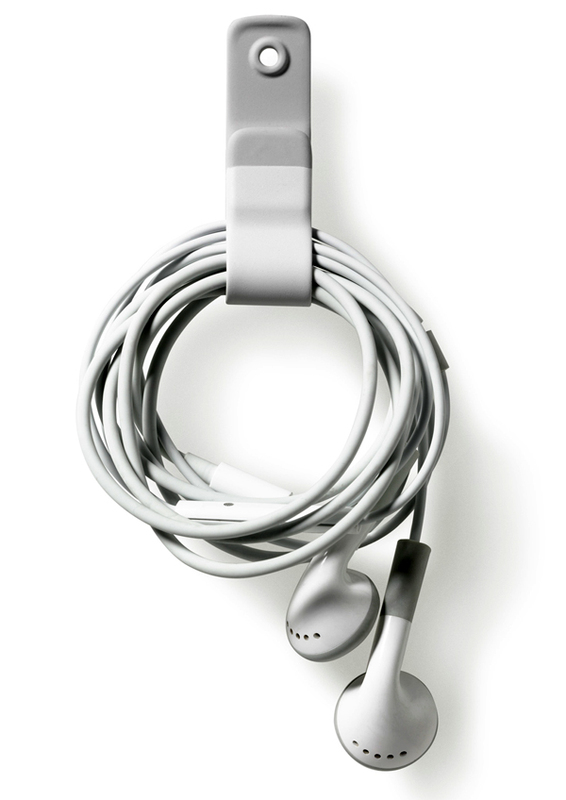 As we made mock-ups of the magnetized strap, we were won over by the simplicity and elegance of this solution: a minimal strip of material that could be attached to any headphones’ plug to keep a cord coil wrapped, on or off the device. With our design concept in hand, we moved to engineering. The simplicity of the Sinch belies the complexity behind its engineering. Material science and process engineering were big consideration in making the Sinch a reality. Plastics have memory – that is, their flexibility tends to wear out over time and use. In order to avoid this fatigue we settled on using silicone, an extremely durable and sophisticated technical material more commonly found in medical products. The challenge was to work out the best durometer, thickness, custom colors, and process to take a common industrial material and make it consumer facing. Determining the ideal magnetic strength was equally important to the end user experience. Fully encapsulating the magnets in the silicone is key to the design. Molding liquid silicone in itself is an expertise within the plastics industry: insert-molding the magnets, and then co-molding the different colors and durometers, added further complications. Frog, Dune Road Design, and our manufacturing partners took the time and made the effort to get it right for the experience we envisioned. The effort we put into the design and engineering of the product was mirrored by the effort we put into the retail packaging,web site design, and other marketing collateral to support our goal: building the Sinch brand, not just one product. The packaging is substantial, to convey quality, and compact — so the delivery system is as efficient and purposeful as the product it contains. 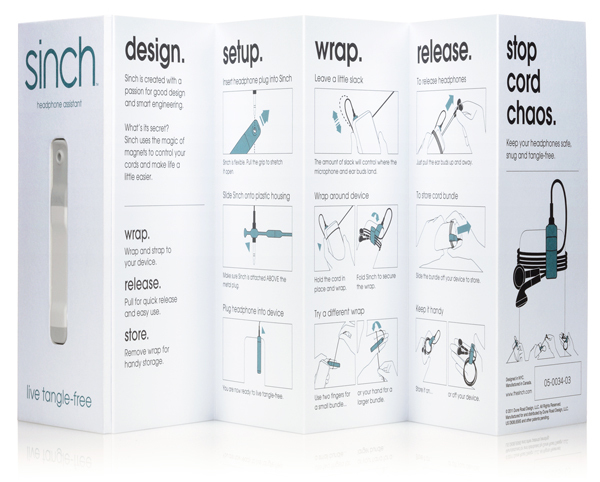 The Sinch packaging is designed to pique consumer curiosity and encourage interaction while showcasing the unique features and functionality of the Sinch product: e.g., we used the magnets in the Sinch to locate the product in its framing pocket. The instruction manual and the packaging are in fact the same element, printed on accordion-like card stock, with attractive graphics to show the many ways the Sinch can be used. This concise and clear information indicates the easy, positive experience consumers can expect from the Sinch. Similarly, our website design is intended to draw users in and engage them with the Sinch. It is mirrors the packaging in the way it clearly explains how the Sinch can be used,as well as showcases the innovation behind the design. The website allows fans to share experiences with the Sinch gives shippers a convenient e-commerce portal for purchasing the Sinch, and entertains visitors with fun video shorts about the Sinch. Our collaboration with Dune Road on the Sinch product and supporting brand identity has meant careful consideration for how a brand is built. We have created a solid foundation for the future development of the Sinch brand: innovative, engaging products based on a deep understanding of user experience and a passion for smart design. We intend to continue offering solutions in the Sinch product family that have an equally sleek aesthetic, sophisticated functionality, and playful personality. Great idea! I bet they’ll sell like hotcakes! So simple but extremely essential. Love the packaging that it comes in. The brochure design is pretty decent also! I really like this idea with the magnets but it bugs me why its so expensive & has an Apple look about it when it is supposed to be an independent brand for all devices on the market. This runs through the packaging as well & even the video is like an Apple bi-product. I love the packaging accordion affect but since the product is off white I think if the colours were reversed on the front page the product would stand out more. (blue grey background & white text). The product seems much simpler than the instruction guide, that doesn’t look so clear! Get rid of that !